After not posting for over two months, this is a good one. If you believe in fate, luck, or the universe, this is the story of stories. After a two frustrating summers in a row with injury, canceling my key races and developing a hateful attitude about New York, my job, blah, blah, this is almost unbelievable. 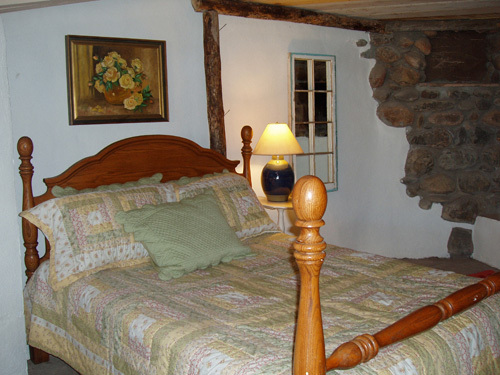 A sleepless last Saturday night I was surfing Craig’s List real estate ads first for the New York Adirondacks and Northern New Mexico. I have been doing this on and off for five years with big fantasies to sell my apt, leave my job, live simply and just make art and train and race in some beautiful place. Reinvent myself so to speak. Why five years? 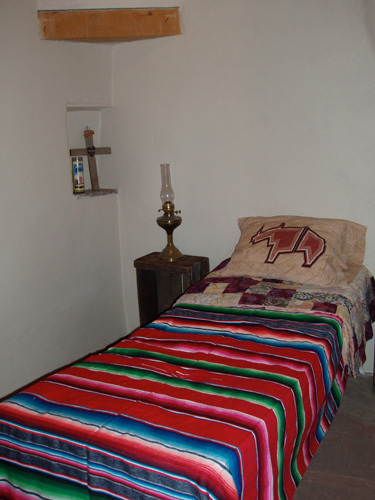 That is the first and last time I went to New Mexico. 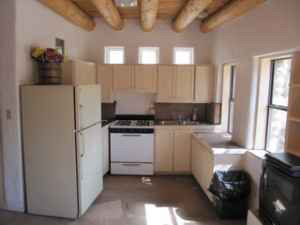 I was an artist in resident at the Santa Fe Art Institute and after the residency my then girlfriend Lisa and I rented this amazing round stone house in Abiquiu Every house I have looked at I compare to that landscape and that house. That year was a turning point in my artwork and my athletic prowess. 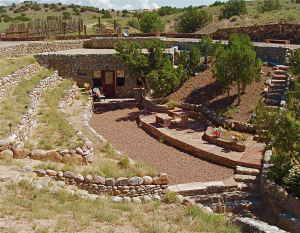 The house we stayed in was built by Pat Frazier and master stone mason Felipe Leyva. Pat moved to NM from California. 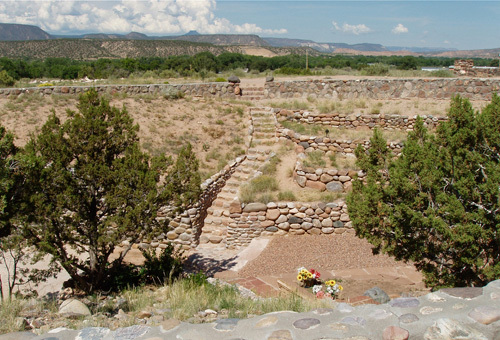 She was a radiologist who took a vacation in NM; fell in love with it, bought some land. She eventually took a class at the Northern New Mexico Community College on how to build adobe and moved to NM full-time. She met Felipe and they began building houses. 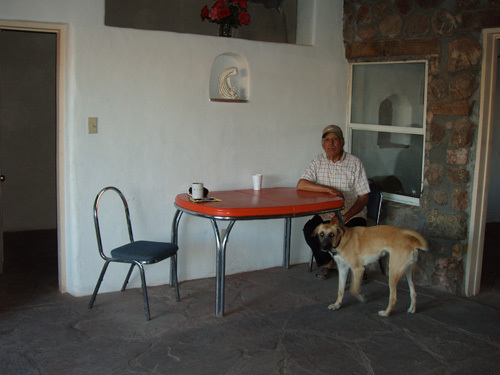 Pat gave Felipe 2 acres of land to build his own home which Lisa and I saw the beginnings of it back in 2005. Back to Saturday night. 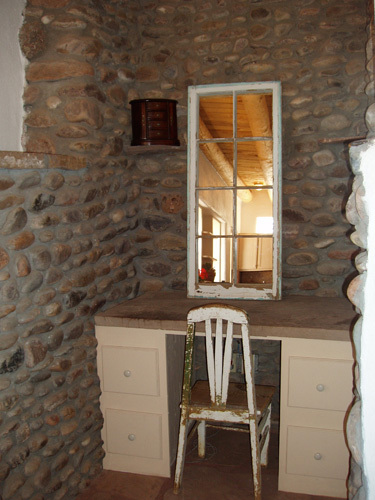 I am looking through Craig List and I see this amazing stone, what looked like steps cut into a channel on two walls of earth meeting in the center with a sweet little casita. There is a photo of a chapel and kitchen and I am immediately thinking about Pat and the stone house. I read the ad, and not only is Pat’s name there but so is Felipe. 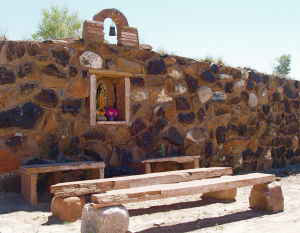 It is the house he built for himself completely out of stone and adobe. I almost had a heart attack! I especially almost had a heart attack because I could not believe the price. I immediately emailed Pat and told her how Lisa and I stayed there and how I want this house more than anything in the world. I want to live there the rest of my life, dust my ashes there when I am dead. I want to go there, set up a printshop, invite artists to make prints and my athlete friends who can train at altitude, (6k feet) not only running for miles, but biking and swimming. The 5200 surface acre Abiquiu reservoir is only a couple miles away and mountains including the iconic view of Georgia O-Keefe’s Pedernal surround us. Now how is it one can be so lucky as to live in the desert and have a reservoir a couple miles away that you can swim and kayak? Now the obstacles. I must get all the money in cash, which is definitely not in my savings account. I need to do it immediately, buying it with a leap of faith sight unseen. A deal with another interested party needs to fall through and to top it off, it must all happen in one week. So I offered a little extra money. I emailed Lisa to tell her how she will not believe it. And while it never crossed my mind, when she said, “I love would to own a home there” I offered. Why not? So we will be co-owners. I wired a deposit on Monday, Lisa wired money to me, I took money from my retirement and it looks like I will wire the remaining cash on Friday. 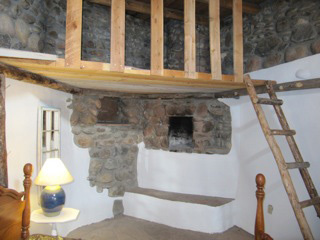 I will fly down in a couple weeks to see our new two bedroom hand build adobe and stone casita. I want to sleep on the roof and wake to the sunrise. To top it off I will probably use the most more than Lisa, staying there during my academic breaks in December, January, June, July and August. So what about all those other times? Felipe was going to move in with his son-in-law who lives a short walk away, but why not let him keep living in the house, care take it and work exchange to build a print studio? This way he keeps living in the home he built. He will be there to maintain it pay the electric and water bill and we will use it when we can. In 2013 I get my next sabbatical and I have no plans of returning to my job. You will find me running in the mountains, swimming the Abiquiu Lake or in the studio. For friends and friends of friends if you are wondering, yes you can rent it.